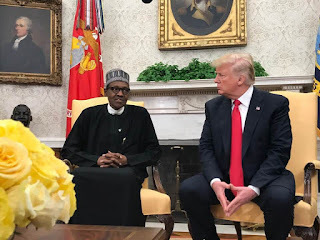 President Muhammadu Buhari says it is better he keeps quiet on President Donald Trump’s alleged insult on some African nations, including Nigeria, because he could not verify the validity of the allegation. According to a New York Times report in December 2017, Trump was alleged to have said Nigerians “never return to their huts” after seeing America. The White House has, however, denied the statement. Asked during a question and answer session with journalists after a joint press briefing with Trump, Buhari said he exercises caution with press statements about other people. “I’m very careful with what the press says about [people] other than myself,” Buhari said. Trump, in his own session with journalists, also said they did not discuss the issue. “We didn’t discuss it. You do have some countries that are in very bad shape. We didn’t discuss it because the president knows me and knows where I’m coming from,” Trump said. Trump further gave assurance of the speedy release of the $496 million worth of Tucano aircraft sold to Nigeria by the US. Meanwhile, Buhari has assured the US that his administration remains committed to the principles of human rights as well as the promotion and protection of people’s freedom, even in the process of fighting terror. Buhari also thanked the US for its humanitarian assistance in the insurgency-torn north-east region. “We commit to ensure that all documented cases of human rights abuses are investigated and those responsible for violations held accountable for their actions,” Buhari said. “The USA has been to date the biggest contributor to the humanitarian response and last year gave approximately 500 million US Dollars in cash and in-kind contributions through the United Nations and other inter-governmental organizations. “These have mainly supported protection activities, health, food assistance and shelter. Buhari added that his government was doing all it could to secure the release of Leah Sharibu, the Dapchi schoolgirll still in Boko Haram custody. “In this context, we will continue to welcome US collaboration in intelligence gathering, hostage negotiations and information-sharing,” he said.